Based on the long-running television show about a crack team of FBI profilers hunting serial killers, the new Criminal Minds mobile game has no qualms about depicting cartoony atrocity by murdering a family of four in the first minute. I got into Criminal Minds while I was hospitalized earlier this year. Forced to watch commercial television until I got enough movement back in my hands to operate an iPad, the adventures of Quantico’s finest were regular daytime fare. When I got out of the hospital, I started binging the program, though I had to take regular breaks because it gets so damn dark. 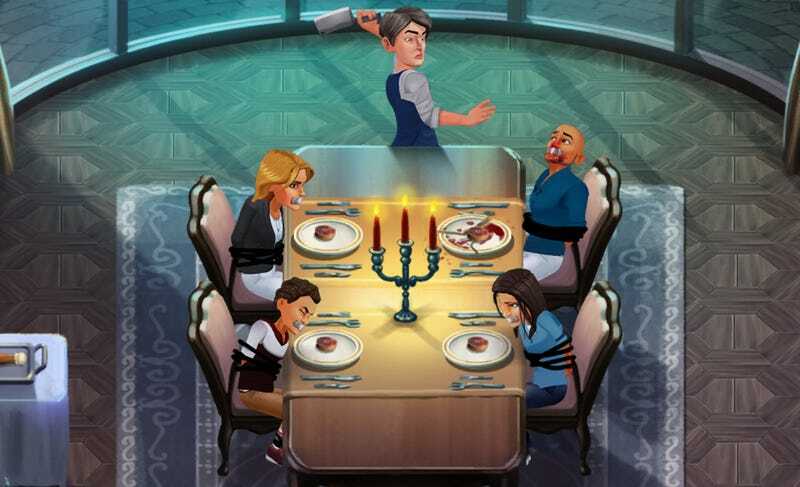 So it’s no surprise that the free-to-play mobile game, released earlier this month for iOS and Android, goes straight for the family murder. Pretty sure the police officer there is standing in blood. It’s freaky and disturbing, in some ways more disturbing than the show. Maybe it’s the stylized cartoon look of David Rossi and crew. Animated Joe Mantegna looking concerned over the cartoon corpses of a husband, wife and their two children is just wrong. The beautiful family is off to the side, splayed out dead around the dining room table. The mobile game is a casual affair. Players tap icons, assigning members of the task force to examine bodies, look for clues and chat about criminal motivation. Searching for evidence with agent Rossi involves things like tapping on bits of the children’s hair the killer left on the floor while collecting trophies. Occasionally the team calls spunky technical analyst Penelope Garcia back at Quantico, to look for clues on her computer. Damn, Garcia, could you be a little less happy about it? 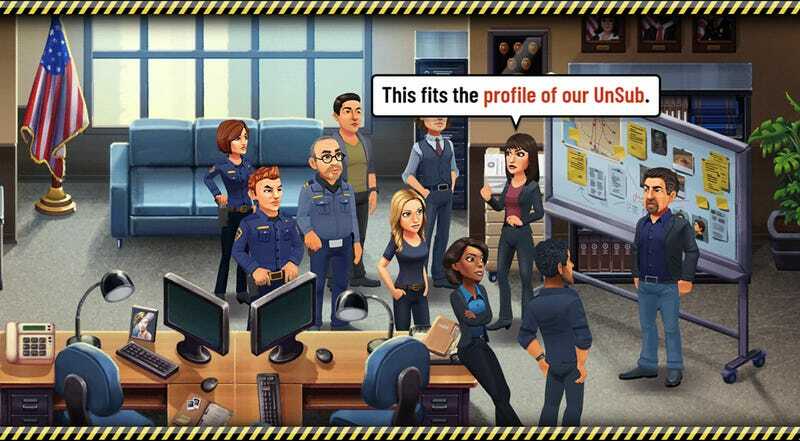 The gameplay might not be very exciting, but Criminal Minds: The Mobile Game is incredibly faithful to the show, and not just the murdery bits. Once all of the clues are analyzed we get to my favorite part of every episode: delivering the killer’s profile to the local authorities. Just like the show, each team member delivers their line and then passes it to the next, as if they rehearsed for an hour beforehand. That’s so typically Criminal Minds that it made me laugh out loud. I almost forgot the dead family at the dining room table. Oh don’t worry, there are more where that came from. They look as uncomfortable as I feel.